If your life revolves around Tetris, Star Wars or even computers and binary code, why not dream it and wake up to it as well. Let’s face it, we love it so why not wear it too? Lucky for Geek culture we have numerous designers and brands helping us sleep easier with the things that we love most. Here are three ways you can geek out your sleepwear and love waking up in the morning from CrazyforBargains.com. Just because we may be geeky that doesn’t mean we can’t be fashionable. Tying in our love for the 70’s, 80’s, and even the 90’s has never been easier with sleepwear and fashion. The first thing to think about are the pajamas that will properly show off how we feel. Many of us probably share plenty of ecards about coffee and mornings so why not incorporate that into our pajamas. That is why LazyOne pajamas has come to the rescue. The red I’m Unstable in the mornings night shirt for women not only brings our love of coding all night and coffee into one piece, but it is completely Geek Chic. When you take this shirt and combine it with a pair of I’m moody 70’s styled red shag carpet slippers and our plush 80’s and 90’s inspired zebra print lounge pants you have an awesome geek chic sleepwear style that any women would love. The nice part is that the lounge pants and shirts come in regular and plus sizes to match any body style or type. The pink Bad Hair Day shirt with the cat is another must have. For the guys it has never been easier to beam yourself to the bathroom in the morning. The first step in going Trekky in the morning is to find the perfect pair of Star Trek pjs. You can do the one or two piece sets. I prefer the two piece sets. Not only are the comfortable, but they actually look like and resemble a costume from the show. The next thing is to get yourself covered. 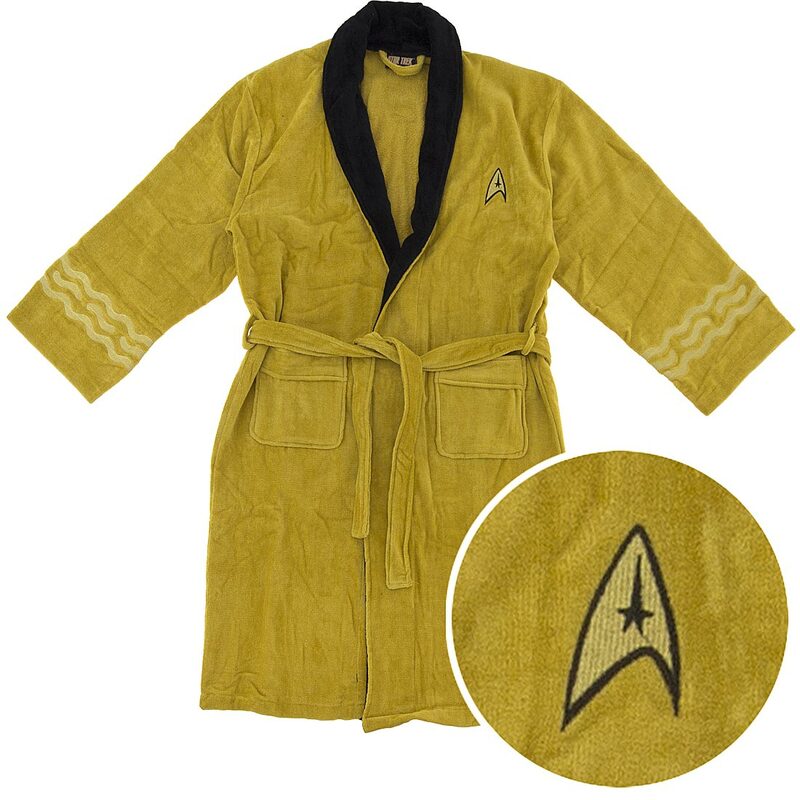 There is nothing better to match the Starship’s spa than wrapping yourself in a Star Trek robe. To complete your look you may want to try plain black slippers that look like shoes a captain or person on the Enterprise would be proud to wear. Christmas Geek Chic for the family. The last look can be done for men or for women. 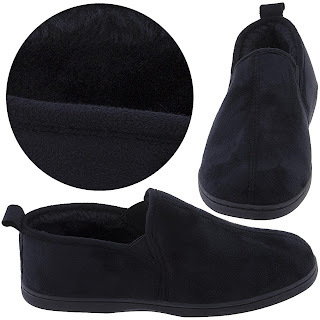 Some of these are technically for men, but this is loungewear so having things be a bit more roomy can be better for adults. The holiday season is an awesome time for many people. Since it’s July, why not start to celebrate early with Christmas in July. You can also use these styles as the perfect time to take a family or holiday photo at the beach or somewhere else that will look awesome when it’s cold in the winter. 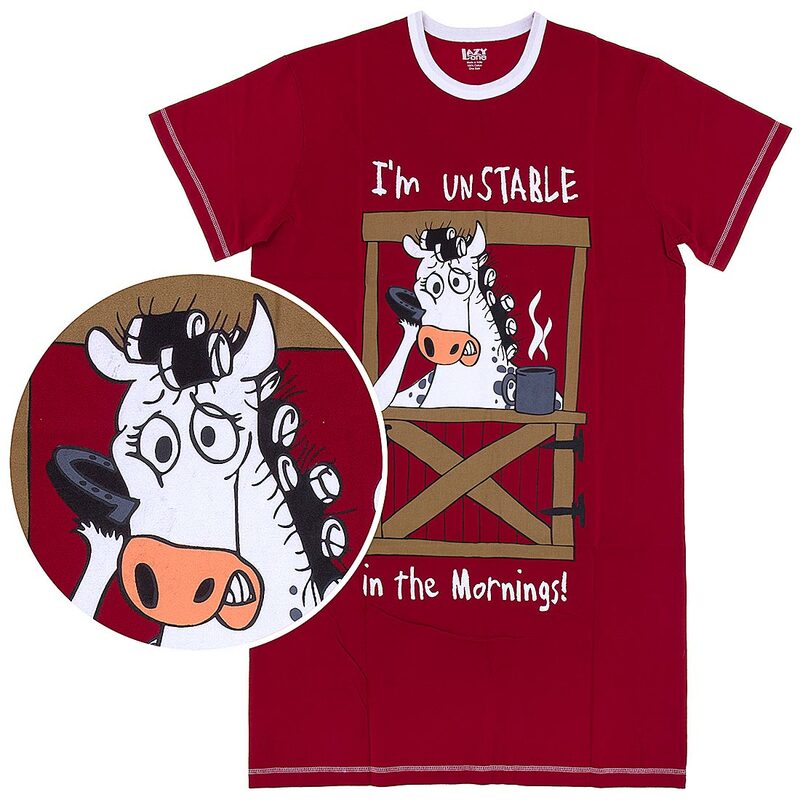 Ditch the ugly sweaters and go for some seriously cool holiday themed geekwear sleepwear. 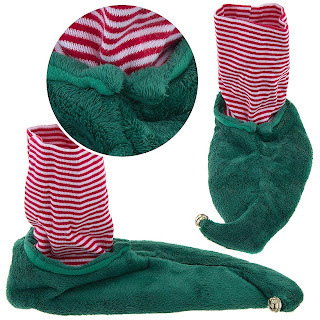 The first thing are the elf shoe slippers with stockings. 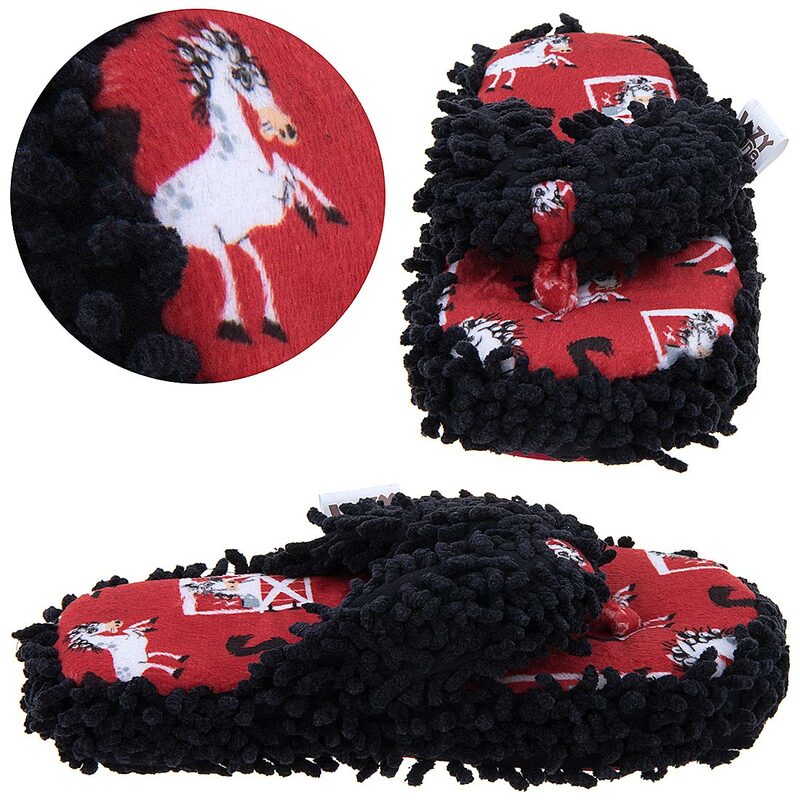 They come in Men’s, Women’s and children’s sizes so everyone in your house can enjoy them. The next thing to do is find something the family can enjoy. 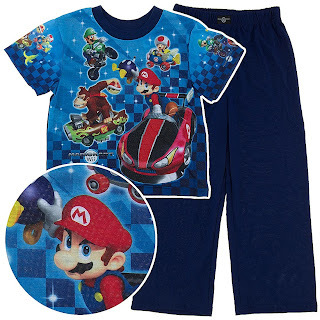 The obvious one is footed pajamas for the family which are always perfect, but I like themes. Here’s one you may not have known about. For dad, choose the Doctor Who bathrobe (it comes in the style below as well as the Time Lord Tardis styles). Combine it with the slippers from above or the elf ones to match everyone else from below and you have an awesome look. 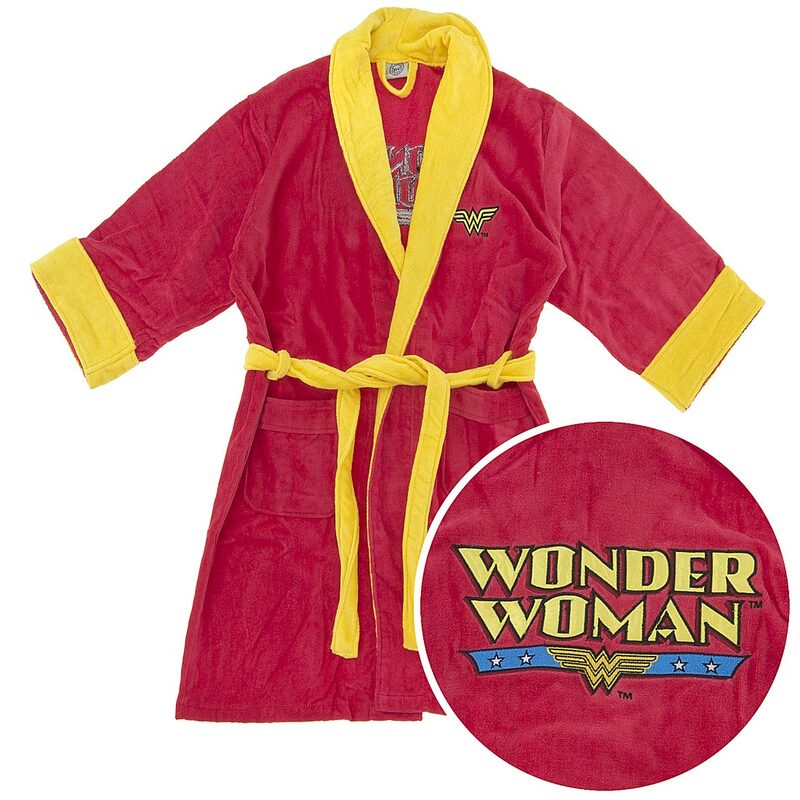 For mom, go for any solid colored tops and bottoms and pair it with her secret disguise with the Wonder Woman bathrobe. 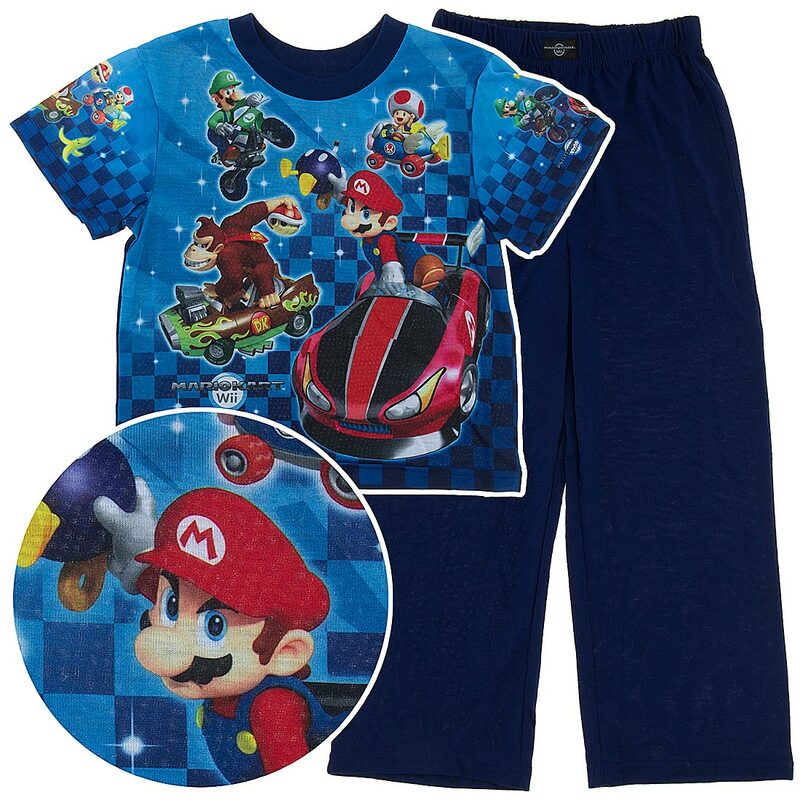 For the kids, you might want to try the Hello Kitty pajamas for girls or Super Mario pajamas for boys. Nothing says a geeky holiday photo like old skool games and cartoons for the kids, Doctor Who for the men and one of the most loved symbols for women and power Wonder Woman. If you want to theme it, we do sell Marvel and/or DC comics pjs for the whole family so you can do superheroes, a specific game, countries cartoons or just an all out geeky look combining everyone’s favorite obsessions. Geeking out your sleepwear not only means bed time can be fun. But you can also have a fun themed or fashionable holiday photo with elf shoe slippers and matching themed or footed pajamas. 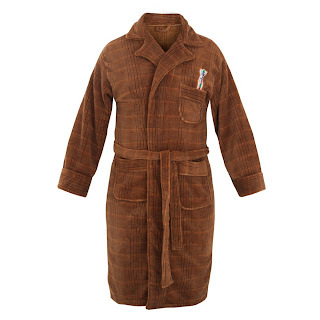 You can also geek out to almost any of your pop culture icons with bathrobes, boxers and lounge pants. Think about what you love and then take those colors, themes and even tie in something obvious to make a cool and geek chic inspired outfit that only a true fan can love. No convention is like San Diego Comic-Con. I’ve been around and so far, nothing has compared to the size and circus that is Comic-Con. It’s a feeling of being home amongst friends – even though you haven’t met most of the tens of thousands of people there. I almost hugged him – not for the compliment but because I was among people who get it. Who get me. I spend most of my days in an office full of people who don’t understand things why I loved Pacific Rim so much and had to make a tank top in the few days between seeing the movie and Comic-Con. When others give me that askance look I sometimes I feel like my enthusiasm over something as simple as a movie or book or toy is childish. I know it’s not, and I love that I am young at heart and can be passionate about things (I feel sorry for those who don’t get excited about anything, honestly) but it can be draining to be around people who think you’re silly. Cue Comic-Con where geeks and like-minded people invade a city. The convention doesn’t end after you step outside of the convention center. You’ll see lanyards, costumes, banners, exhibits, and themed menus damn near everywhere in a two mile radius. Some people may count not being able to escape as a negative, but I love being immersed. If I talk about being traumatized by the Red Wedding and crying over it for days, chances are good a few people around me will sympathize rather than rolling their eyes. It’s a safe place for me. I’m not saying I don’t get worn down. Walking the mile from my hotel over to the Hilton Bayfront for a press room and then over to Hard Rock and back to the convention center to race to Ballroom 20 is exhausting. I get tired. I get hungry and cranky. It’s still worth it though because even though it’s hard work, I still spend most of the five day marathon that is Comic-Con smiling, laughing, and waving my arms around in an animated Muppet flail. So much I see there is heartening. From cool toys to fans who pour hours into costumes to people dedicated enough to wait overnight in line for Hall H – it all lets me know I’m not alone. Even on the last day of the convention when I was feeling completely wiped, I transformed into a giddy girl when I saw the life-sized LEGO Bag End set up by the Bayfront. I’m sure the stoic security guard thought my bouncing around was crazy, but I didn’t care. Posing on the steps of Bilbo’s blocky house fueled my day and the fun continued right up to the end when I spotted a little girl in a TARDIS Transformer costume. On my walk over to the Bayfront that day as I dodged costume parts and people handing out free bandanas, I heard a man telling his companion in an awed tone, "They shut down streets for this, it must be a big deal.” Yes, yes it is. Few judgments, few weird looks, kindred spirits, and awesome eye candy - those are the reasons I do everything in my power to go to this particular Comic-Con every single year. Others just can't top it. Did you see Pacific Rim yet? If not, it's okay if you stop reading and run to a theater. Seriously – I encourage it. I saw it Saturday night, and I've been high on feelings of happiness ever since. To the point of getting a t-shirt custom made for Comic-Con and already ordering blue clip-in hair pieces so I can look like Mako, the female lead of the film. Pacific Rim is everything I didn’t know I wanted in a movie about giant freaking robots fighting giant freaking monsters. The word epic barely does it justice. There isn’t? You could have fooled me. The horrible article goes on to discuss how Pacific Rim failed the Bechdel test but then mostly reviews the film only in context of the hot men in it. I’m not denying some of them were attractive and that for some people the eye candy may have been the main draw, but in the tons of discussions I’ve had about the movie since Saturday, the attractiveness of various characters never came up. Not even once. I mean, come on. Hella impressive Jaegers battling terrifying Kaiju and you think the looks of the actors are the only part of the film worth mentioning?! How do these types of articles get through at EW? Even the title of the article isn’t okay. The truth is the reasons Pacific Rim is a good movie for geek girls are the same reasons it’s good for anyone else. It’s packed with killer action, stunning visual effects, Idris Elba being fantastic, and more fist-pumping moments than should be allowed in a two hour movie. Your inner child will scream with joy. It’s one of those rare films that makes you leave the theater feeling like you could take on the whole Empire yourself. I liked it a little bit. 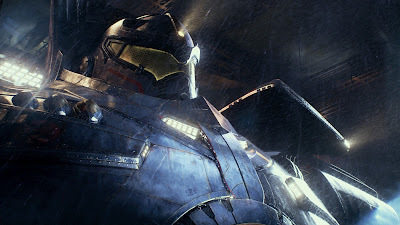 Pacific Rim tells an apocalyptic tale in a fresh way. Gigantic monsters known as Kaiju live beneath our surface and break through a breach to terrorize coastal cities. They kill thousands of people and to keep them at bay we build equally massive robots called Jaegers to fight them. After we’ve had years of easy victories, we have to become better and more inventive to defeat the Kaiju. We follow a small cross section of the military in charge of the Jaeger operation through a trying point of the human vs. monster war. It is our most desperate hour and if we don’t step it up, we die. The scale of the battles between Jaegers and Kaiju is just incredible. Mind-blowing, even. And you don’t need to be a giant robot enthusiast to enjoy and admire them. It’s easy to put yourself into the shoes of civilians running from Kaiju or in the place of a worker responsible for Jaeger repairs and be awed by the size. You're immersed because the world-building is done so very right. Awe is one of the first words that comes to mind when I think of Guillermo del Toro and Travis Beacham’s story. Besides the large cinematic slices of dessert for your eyes, I’m in awe of the details. Two neurally connected humans operate a Jaeger; it would have been easy to limit it to one person but this alternative provided more potential for interesting moments and relationships. I appreciate Mako’s backstory and determination. Small visual cues like the bright blue streaks in her hair and the blue JELL-O that matched the color of the Kaiju’s phosphorous blood tied everything together. The Kaiju have been around so long they’ve become part of our world and way of living, and the moviemakers show you evidence of it. ILM did a knock-out job with the effects, and Ramin Djawadi added another layer with his music. Pacific Rim did have its flaws but for me they weren’t deal breakers. The dialogue fell into the corny territory on more than one occasion. For the record, Idris Elba’s character Stacker Pentecost’s line about canceling the apocalypse is not corny. Not even close. The primary character – Raleigh Becket – wasn’t as developed as he could have been. I’d like to have seen just a touch more of his glory days and his fall to rock bottom in order to get behind him more. And more ladies would have been nice, but I’m pleased with Mako Mori and Rinko Kikuchi’s portrayal of her. She's a fine role model and obviously formidable. Overall, those minor issues for me to grapple with on a much bigger landscape. It's a film that takes you on an insane and fun ride. Pacific Rim isn't just a good summer movie; it's perfect for any goddamn day. I don't get nerd-righteous about too many things, but when I do it's usually about spelling. Wookiee has two es, it's Lucasfilm not LucasFilm or LucasFilms, and for pity's sake Spider-Man has a hyphen. 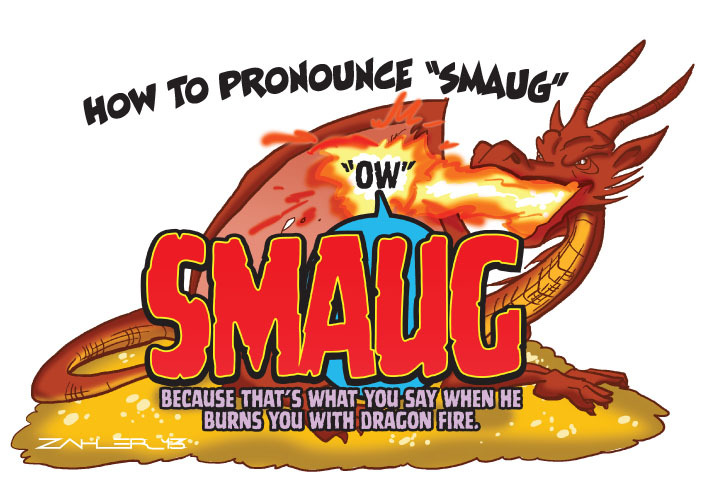 PS: This isn't meant to nerd shame anyone. I just thought it was a funny idea. Last year, my friends and I played the roles of Gamemakers and hosted our very own Hunger Games (party). Don’t worry, no one died. Our version of the game substitutes water balloons and super soakers in for serious weaponry, and we drink and eat and have fun. Holding a second round of the games – our Quarter Quell if you will – seemed like an inevitability. Thanks to our generous host, the arena for this match even had a pool. Yes, it was perfect. We took a few themes from the second book, Catching Fire. There was the water element obviously, we pulled a list of food and drink from the book (thanks Fictional Food! ), and justJENN used the recurring theme of yellow flowers and chocolate mentioned in the desserts to come up with fabulous and delicious cupcakes. She even served them in tiny flower pots. Gamemaker Autumn came across some football flags that made for a much sturdier tag than the streamers from last year. Gamemaker Sarah brought the booze, and our white sangria was far superior to Haymitch’s white liquor. I think it was just as strong though. And I wrangled some food. I baked some kabobs, brought fresh bread, made a salad, and put out platters of cheese, fruit, and nuts. It was light fare but that worked since it was such a warm day. Tributes volunteered and put their names in the reaping bowl. We drew everyone’s name (hey, you’re allowed to include stuff just for the sake of show), and one of the party attendees did a heck of an Effie imitation. We fired up the fog machine in the back and the tributes stood at the ready around the pool. They had to dodge other contestants, flying water balloons, “acid rain” from the hose, and they had to be careful not to slip on the wet ground. I watched from the sidelines with my sangria. I’m such a resident of the Capitol. The pool provided a challenge because the final tributes ended up in there, and it was hard to even see how many flags were left on their belts. One eventually emerged victorious and we gave him wealth, a house, and food for life. Actually, no, we just rewarded him with a tiny Hunger Games toy. It’s almost the same. Now we just have to figure out how to top it next year. It's 11.5 feet long. You could practically wrap it into a mini dress (I hope someone's done that)! Wear it to a convention, for Halloween, or just to bundle up on a cold day. 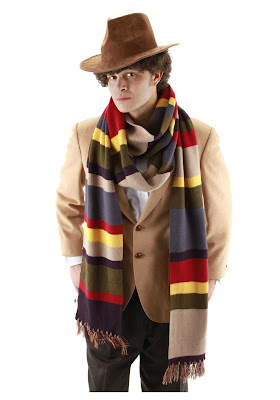 It would be blast to wear this in everyday life and meet fellow Doctor Who fans who recognize the pattern. Comment here with a favorite Doctor Who quote by Monday, 7/8 at 9pm PST. You can get an extra entry if you comment AND tweet about the contest. Just leave a link to the tweet so I can check. I'll assign each entry a number and choose one randomly. The winner needs to be in the United States; the scarf will be shipped directly to you by HalloweenCostumes.com! Be sure to browse their site for fun props and outfits! Seriously, I owe you all thanks. I appreciate you following my blog, stopping by from time to time, and leaving thoughtful comments. I couldn't do what I do without at least a few people reading my words. LEGO minifig versions of characters are a weakness of mine. Sometimes I'm tempted to buy a whole LEGO set just because of the minifigs included. I've barely dived into the world of customized figures, and I can tell it's going to be dangerous. 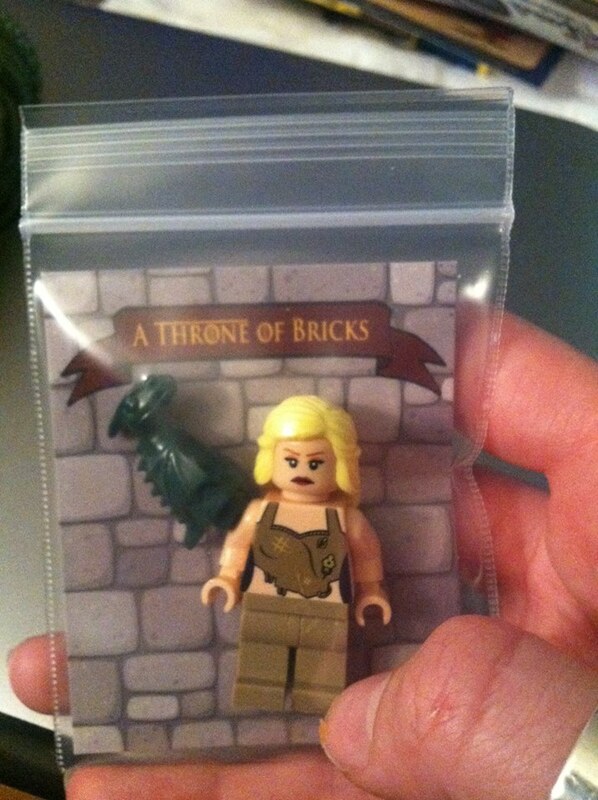 Just look at this Daenerys Targaryen figure! Etsy seller miniBIGS has come up with a whole Throne of Bricks set featuring the characters from Game of Thrones that you know and love. They don't look quite as menacing in blocky form. I'd still keep an eye on Dany's dragon though. 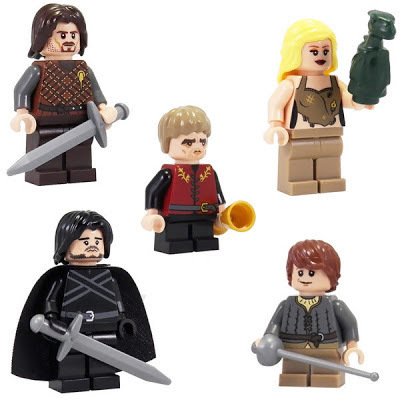 Series one includes five figures - Tyrion Lannister, Ned Stark, Jon Snow, Arya Stark, and Daenerys Targaryen. Each figure comes with a fitting prop - a glass for Tyrion, Needle for Arya. It's perfect. What I really love about these figs is the level of detail. Just check out the embroidery on Tyrion's doublet, the Hand of the King pin that Ned's wearing, and the fabric print of Arya's undershirt - it's just like we see in the TV series! miniBIGS does fantastic work. Round one sold out in no time, and they're taking pre-orders for the second printing happening in August. They'll only print 80 more complete sets. Since this series ended up being so insanely popular, miniBIGS is considering a second series. To this I say, yes please!